Why Choose Reformer Pilates Private Sessions? Especially if you are new to Pilates, starting with private sessions is very helpful and the benefits are endless. Our highly qualified instructors will teach you all the basics and all the Pilates’ principles, as well as introduce you to the equipment if you aren’t yet familiar. We believe that Pilates should be available to everyone. Let our team show you how to get all the wonderful benefits of Reformer Pilates or Yoga with our private sessions. Enjoy the benefits of one-on-one private sessions from Everbalance Yoga Barre Pilates studio in Jacksonville, Florida. Our personal trading sessions offer a variety of perks that help you focus on your goals. Our instructors are experts at holding you accountable without making you dread your workout. She or he will be waiting to greet you warmly with a smile every time you show up. After you express your desired goals, your instructor will work with you to develop a realistic and achievable plan to attain your goals. This personalized attention allows you to create a routine specifically designed for your needs, based on your abilities, and allowing you to maximize your time without becoming overwhelmed. 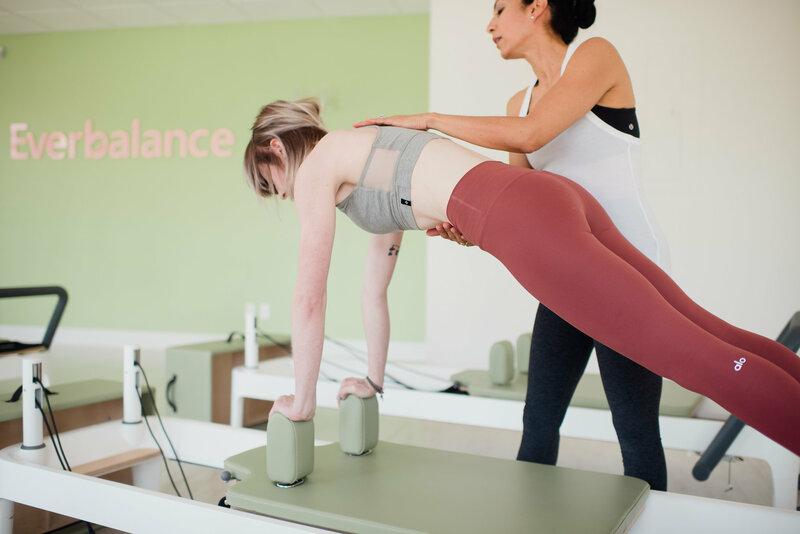 Private sessions at Everbalance means having your instructor by your side, giving you immediate feedback on your form and technique. Trainers are professionals with the experience to recognize which movements and positions to focus on or correct if needed. They pay attention in order to balance your mind and your body and help you understand the exercise you’re performing. In order to develop that mind-body connection, your instructor makes sure you’re doing each exercise correctly so that you receive the full benefit of the workout in addition to preventing an injury. The Pilates Reformer is the most well-known piece of Pilates equipment. To some, reformer equipment is a bit intimidating at first. It resembles a single-bed frame with a sliding carriage and adjustable springs that regulate tension and resistance. The cables, bars, straps, and pulleys allow exercises to be done from a variety of positions, including standing. Because this contraption can look daunting, many students start with a few months of private sessions before moving on to group classes. At Everbalance, completing a series of private Reformer Pilates sessions before participating in group classes is not required, but highly recommended.